Under the USGA golf rules, rule 16.1 D prohibits a player from testing the surface of the putting green. Mark Wilson discusses some situations where Rule 16 comes into play and scenarios, like being on the practice putting green where the rule does not apply. However, when you are playing make sure you know what the local rules are and where they are applied. I played a game where my opponent on the tee box swung and missed the ball. The ball fell off the tee, I believe it was the wind disturbance from the driver. He attempted to pick up the ball and put it on the tee to make his second shot. I told him that he could not as “the ball is now in play”. He disagreed and argued forever. I referred to Rule 11.3 which I find not clear on the subject. Can you help me here with your views on the case as presented by me? 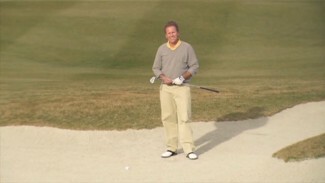 If your opponent’s was intending to hit the ball with his swing vs it being a practice swing, you are correct. If he made a swing at the ball intending to hit it, missed and the wind caused the ball to fall off the tee, the swing counts as a stroke, the ball is now in play and he would be making his second stroke from where the ball lies. Hope this helps settle your dispute and good luck on the course! What happens if the player tosses the ball to his caddy and he misses it and it rolls on the green? I see them toss the ball frequently and have always wondered if it would be a penalty. Assuming the player has marked the ball before picking it up, no it would not be a penalty if the caddy misses the ball and it rolls on the green. Thanks for your question and hope you enjoy your next golf round. Hi, Rick. Thanks for your question. 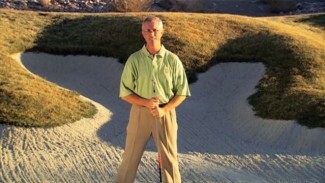 Yes, you are allowed to repair the area of a previous cup placement that is on your line of putt. Hope that helps and enjoy your next round! Can you please confirm or not, that a player may mark a ball on the green by pressing a tee into the ground? I am aware that a tee maybe used to mark a ball, but does this mean by laying the tee along the ground, rather than in the ground?